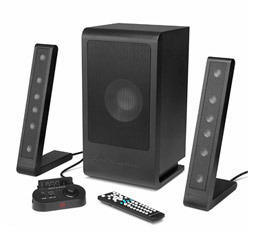 From what I understand in my geek world, Altec Lansing does not have a good reputation for having the best in speakers. But you could have had me fooled since the Val-caves been using Altec for years. This year however I think Altec is gonna change a lot of minds, because what they had on hand surely impressed the hell out of me. 2.1 speakers are a big hit not just with TOV but anyone who work and/ or sleep in a small space. First up are the FX6021 speakers. I like the slim design of the main speakers but what really rocks is this new technology called Inconcert Technology which really brings out the audio and makes it feel like everything is right there in front of you. Do I agree with that statement? Yes I do… for now. Hey it was done with their samples and that’s nothing really to go by is it because The Val-test awaits the fx6021. On a similar note I also got the chance to check out Altec’s PT6021, which is almost the same as the FX6021 except it sounds better, comes with brackets so you can hook the speakers up to a flat panel television and also comes with a universal remote control. I’m not sure why the speakers need a universal remote, but I don’t ask I simply tells it likes I sees it. Look for more on Altecs speaker line in the coming months. The FX6021 retails at 249.99. And the PT6021 goes for a whopping 349.99.